Early this year I was planning to revisit Newfoundland that because we had enjoyed there so much back in 2009. 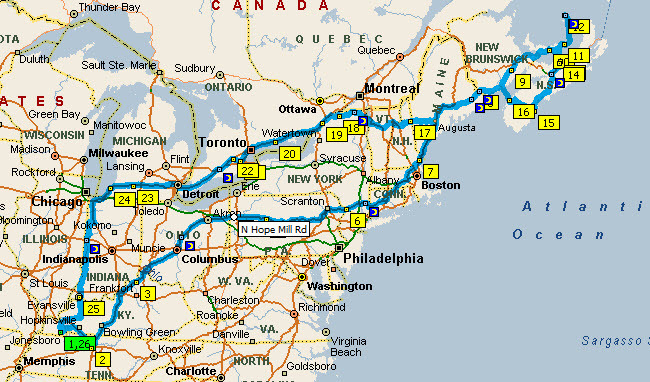 In thinking about the route I decided we would have to visit Prince Edward Island (PEI). This is the one of the ten provinces in Canada we have never been to in our lives. When I started planning a route through PEI I discovered a dotted line on the north shore that went due north and showed a ferry route. I followed the line on the map and it stopped at the Magdalen Islands 85 miles north. I had heard about these islands from Great Loop friends who had visited there when they did the Down East Loop. It's a chain of islands (archipelago) in the middle of the Gulf of St Lawrence that is part of Quebec. The islands were first inhabited in 1765. The French name for the islands is Iles de la Madeleine. This map shows our route. (click to enlarge) On our way back we will visit friends at Port Medway, Nova Scotia, and attend a wedding in St Joseph, MI. This will be the only post until we get to PEI as we have a lot of driving to do every day. Maybe next year we can revisit Newfoundland.